[3.0] Mjolner Unleashed! Beserker, 3.5m DPS discharge on a 4link 7k+ life everything down! After playing various versions of discharge over the past 4 leagues and tweaking to perfection, I bring you the most current, comfortable life based version of Mjolner which preforms extremely well as an all rounder able to down all bosses and all content with great clear speed on a 4link. *Edit big discovery made about how Romira's order of operations functions and gaining a second cast on crit discharge on our cyclone boosting our single target dps(yes even only on a 10-20% crit chance). 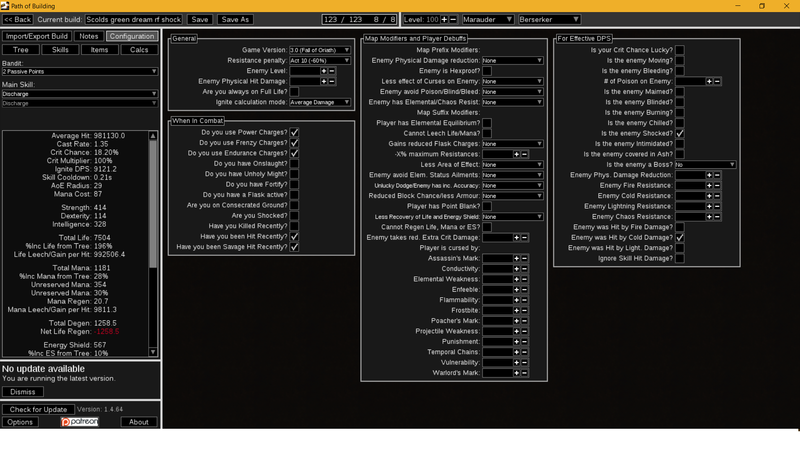 Gem and gear changes added but I wont count the damage in to the path of building stuff as it is hard to calculate. Green Nightmare, +1 charge Flow unthered belt, +1 frenzy Voll's devotion, elemental weakness on hit gloves, 21/20 gems, 10% penetration boot enchant, rare helm to balance my resistances for wise oak and The taming. +1 frenzy charges and some extra all resistance good version for faster trash clear while wearing biscos. This adds intuitive leap to the shadow power charge area gaining a little extra all res and +1 frenzy charges. You must have 40str on helm/jewels/jewelry to make this fit. This tree will not fit for devotos users if you need light and devotion str and int as that costs 2 points so you need to move those stats to jewels to make this fit by 97. This leaves us with another 6% life node open if you are 98+. This would required a small tree change and giving up a little bit of life to be able to do the full setup by 94(92 if you drop the endurance charge above the green nightmare jewel slot). Any extra levels can be spent on 5% life nodes if you are 97+ feel free to take the 15% life and 5% all res up by witch. If you want to spend the 2 points from light of divinity on 10% more life you must have 8% int inya's or you'll need some int on a jewel or ring. 10 str required on jewels/ring. 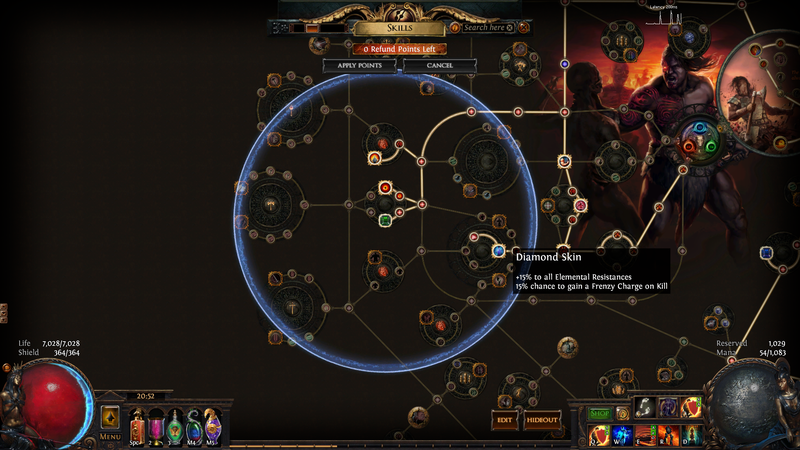 If you spend the 2 points from light of divinity on 10% more life you'll need 10 str on jewels/ring. I have left the path of building slots for rings and jewels empty so you can fit your stat/res requirements as I wear a rare helm and some res on jewels to fix my gaps. Don't include wise oak when working out your resistance requirements remember to untick its box in the items section. For this version, I filled in all the missing gear and jewels to show how much damage and life is available. Light of divinity can be change to 10% more life if you have 8% intelligence Inya's and 10 more str on a jewel or ring. For this version, I filled in all the missing gear and jewels to show how much damage and life is available. Exactly the same build as the devotos version just helmet is changed. This gives around 250k more dps(50k more per discharge). The self damage is tiny as our mana cost is 10 for shield charge and 15 for cyclone so you wont even notice the hits scolds does to you. When doing bosses guardians+ switch green dream/nightmare for something with 7% life/spell damage while holding a shield/spell damage/increased area damage/increased damage. As there won't be trash often enough to generate frenzy charges. Multiply the damage by 5 as discharge procs every 210ms so 5 times each 1.05seconds. 3.5million dps without righteous fire. 1.78m vs shaper without righteous fire. +Reasonable starting cost and able to still do all content without spending 100s of exalts, no legacy or mirror gear required(Though can get expensive when min maxing gear). -Not the best in uber lab due to Vaal pact removing life regen. Though still very farmable with 2 life flasks and the life flask regeneration pantheon. -Not going to set records for clear speed or shaper kill speed. -Sometimes it is hard to see whats going on due to discharge covering the enemy so moving away from things like shaper slam can be a bit iffy. -Balancing resists for wise oak is a pain. -Some people in parties wont want to play with you/complain because their computer can't handle the amount of skills procing. We use shield charge or cyclone to hit a monster. The monsters hit us back cast when damage taken triggers blade vortex it also hits the monsters. We now have two chances to create a power charge via romira's banquet rings special ability gain a power charge on hitting an enemy. Each power charge gives inya's boots a 25% chance that the power charge becomes our full amount of power charges (6 when build is all leveled up). Mjolner fires off discharge, which uses these 2-6 power charges as lightning spell damage. Voll's devotion takes the discharged power charges and creates endurance charges to match the amount discharged. We hit the enemy again creating more power charges 2-6 again, plus the endurance charges from the last discharge are still there so Mjolner triggers discharge again and all 4-12 charges are now consumed and do lightning spell damage via power charges and fire spell damage via endurance charges. Green dream then gives us 30% chance when those monster die to create frenzy charges giving us up to 4 maximum frenzy charges. We hit the next pack of monsters and repeat the cycle of charge generation but now with added frenzy charges to be discharged too for cold spell damage. Each time discharge fires off our helmet enchantment has a 30% chance to not consume any of the discharged charges we used for that last lot of damage so we can possible start the cycle with 6 power, 6 endurance and 4 frenzy allowing us to reach peak dps. Behind the scenes we crit roughly once every few hits, this triggers elemental overload giving us a huge 40% more elemental damage. Our other ring or herald of ice gives us cold damage to our attacks, so when we first engage the mobs and hit them with cyclone or shield charge elemental equilibrium procs and gives the mobs +25% resistances to cold damage and -50% to lightning and fire damage. Even though we are using some cold dmg via frenzy charges, the bulk of our damage is coming in the form of lightning and fire spell damage, so that 50% more damage from elemental equilibrium out weighs doing 25% less cold spell damage to them in the first place and just hitting them with 0% to each resistance with all damage types would result in a much lower amount of damage on average. Our massive amounts of leech given free via our beserker ascendancy allow us to leech back any damage taken instantly via vaal pact. Thus making us practically invincible outside of one shots or when there isn't anything around to leech off of. No magic hammer no boom boom! With at least 17% increased cooldown recovery speed or you wont reach 210ms discharge cooldown, 15% and 16% show as 220ms. This item is a massive buff to discharge allowing us to now proc discharge 5 times a second instead of 4 giving us a massive 20% more damage increase. +1 maximum endurance charge is a luxury for a bit more damage with a much bigger price tag. Try to get a corrupt one with the highest mana roll which is 60, preferably with chaos res. With as low as possible reduced spell damage roll. Elemental weakness on hit isn't required I've added how to curse mobs below in the skill gem section. This would just be a quality of life upgrade. These are a must have, the higher the int % the better an 8% intelligence roll will help ease your stat requirements. Higher the life roll the better but int % is the most important part. They will keep your power charges full more often then not giving us big dps gains. Due to gaining an extra discharge in our cyclone we will no longer be able to use saffaels and have to switch to lycosidae. We just can't run cyclone without additional accuracy or 100% chance to hit so this seems like the best option resistance requirements get a bit harder we gain a bit more flat life though which means a decent bump after all the life % we have taken. That has to have cold damage to attacks(this is required to proc elemental equilibrium, each time you hit an enemy with shield charge or cyclone they will then receive +25% cold resistance and -50% fire resistance and lightning resistance for the next few seconds.) If you cannot get cold damage to attacks you can use herald of ice to give you cold damage to hits see the gem section for more information on this option. Then it needs resists/int/str to fill any gaps you have life being a nice bonus. Balancing your resistances for wise oak is quite hard. If you are unable to do this try to at least balance fire and lightning resistance so they both get +10-15% penetration from oak. The resistance number shown in the brackets is the one that has to be the same for wise oak to work for more than one element. This item isn't required until tier 12+ maps. Tier 11 and lower content is fine without it. I currently farm spider forrest with any rolls 3-4 sextants no problem using biscos. Though I wouldn't suggest this until at least reaching level 94 and having reasonable gear. Running without this pretty much halves your dps losing the ability to create endurance charges. with 30% chance for discharge not to consume charges enchantment. It's a great helmet comes with a lot of movement and attack speed, dex and chaos res all good things for this build but sadly lacks any other resistances or life. I prefer to run with a rare helmet with the same enchantment. But if you gotta go fast go with this helm. If you prefer more attack/movement speed go with this helm. Don't forget to adjust your level of faster attacks gem in your cyclone to suit this helmet. I use a rare helmet so I use level 16/20q faster attacks. Devotos would require around level 4/20q If I recall correctly. If you prefer a higher life pool and ease of capping resistance go with a rare. 80-100% increased spell damage. We would barely take any damage from our skills as cyclone costs around 15mana and shield charge around 10. So 40-60 self damage per attack which is instantly leech back on hit. Would require lots of lab farming or deep pockets for a 30% chance not to consume charges helmet enchant version. But does bring another big lot of damage to the build. Easily interchangeable with Devotos. Not really required you could easily wear any chest with a good chunk of life/res/stats to help you until you were higher and able to farm currency for kaoms yourself. Things like carcass jack/kings guard/belly of the beast/good life res stats rare chest etc. Remove roughly 1k-1.3k life from the build to play without kaoms. This needs to be placed down in the jewel slot by the stamina endurance charge node. Switch this out for a life/damage jewel when doing long boss fights that don't spawn trash often(guardians+). This brings us another big damage increase in the form of frenzy charges but sadly we cannot really obtain these well vs bosses so it's much more of a luxury item that helps with clearing trash with a small increase against bosses that bring trash with them or constantly spawn some. But for clearing maps it helps a lot to ensure less left overs after a single shield charge and a great chance of everything exploding and shatter from the cold damage and interaction with herald of ice. Feel free to use with vaal breach gem to be able to gain use of frenzy charges against longer boss fights. This ring can replace your rare ring, it brings a lot of extra damage at the cost of some life and not being able to balance resists without using jewels or a rare helmet. If you are happy to use herald of ice then using The Taming gives us 10% chance to freeze shock and ignite(15% including the 5% we already have in the tree)as well as 30% increased elemental damage, shock alone is a massive dps increase even at the lowest amount and bonuses to damage for each shock/freeze/ignite on monsters. Cyclone for anything that needs more than 1 hit also to proc a second discharge to raise our single target dps. Try to keep your cyclone attacks per second in the 4.5+ range when under savage hits so you are proccing 5 discharges per second. Try not to go too high either no more than 4.8 attacks per second for cyclone. Adjust this via the faster attacks gem level it up less/more depending on gear choices. Like devotos brings another 16% increased attack speed to the build so you would need a much lower level of faster attacks gem in your cyclone compared to using a rare helmet. Cast when damage taken immortal call for long physical invulnerability when it uses up endurance charges. blade vortex to help create power charges per extra hit. Purity of fire and lightning to give us +4 maximum resistance. Enlighten to lower the mana cost of all 3 gems. Last slot can be purity of ice or herald of ice. If you use the Taming it must be herald of ice for cold damage to attacks to proc Elemental equilibrium. Remove enlighten and add elemental weakness 9 on to your cast when damage taken links. Level cast when damage taken to level 6 to be able to support level 9 elemental weakness. This will allow for cursing targets that have time to hit you so high hp rares and bosses. If you continue to use herald of ice without enlighten in this gem setup you will have very low mana around 50-54. If you find this to low and annoying replace herald of ice with summon flame golem until you can gain access to elemental weakness on hit gloves. Feel free to use righteous fire it can replace enlighten but to be honest it isn't really needed as you can see via my shaper video. Remember you will need some flasks with burn removal if you do want to use righteous fire. For leveling from 1-65 feel free to use gear and skills you enjoy. Anything works from two handed ground slam(This is how I started)/face breaker totems(feel free to take ancestral bond and regret it out later)/Even fire storm/fire storm totems. Anything in a tabula will carry you to this point no worries. Soonest you can convert to using Mjolner and discharge would be around level 65. This would require some str and int on helm/chest/ring or use a jewel that adds a lot of stats and converts nodes. Pick up the life and and dex from art of the gladiator at the bottom to meet gem requirements. Next make sure you have purchased the jewel intuitive leap and put it in the top left templar jewel slot. Next start to take all the jewel slots around the tree. Fill these with life %/spell damage while holding a shield/spell damage/area damage/increased damage/any str/int gaps if you want to change helms/chest/rings/ and any missing resistances. First grab the Might +30str node(next to elemental overload) and grab the Light of divinity nodes near where we place intuitive leap and grab devotion(+20str) in the intuitive leap radius, to allow you to change some of the gear you previously had stats on. Next take some of the charges around the tree. Pick up the power charge near shadow first to give you the extra int required for gear changing, you should now have no issues changing helm/chest/ring/jewels if you had int on any of those items. Now take Overcharged and Endurance (within the intuitive leap radius). Then the power charge up in the witch area called Instability. Try to keep amount of endurance and power charges balanced if you need to skip or drop one always drop or skip an endurance charge first before a power charge. At level 91 grab the endurance charge on the bottom left called Stamina. 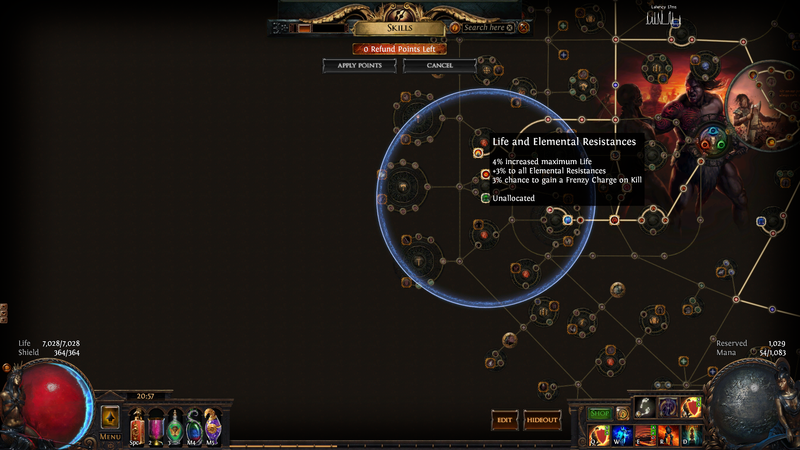 next grab the 4% spell damage per power charge node above Instability in the witch area, then fill in the remaining missing life 2 6% nodes next to devotion. Your choice to take more life, 5% per point or you can grab some extra damage. Take these in this order: Pain Reaver, Cloaked in Savagery, Crave the Slaughter then Aspect of Carnage. We need to get intuitive leap jewel so we can place it in the top left jewel slot between devotion and faith and steel. This will allow us to grab the power charge, endurance charge and devotion plus 2 6% life nodes without having to pick all the nodes in between. Try to get ones with maximum % to life, spell damage while holding a shield, after these two rolls the next best for dps is increased spell damage and increased area damage, with increased damage being last. Don't forget to balance any resistance requirements and missing int/str on the jewels too, but really try to get some life and dps on these as they bring a lot of damage to the build. Green dream or green nightmare if you are rich and want that 10-11% dodge needs to be placed down next to the stamina endurance charge, where we picked up all res 15%, 12% cold res and 3% all res giving us 30% chance to gain a frenzy charge on kill and 10% dodge if you have green nightmare. Major: I like to mostly keep Lunaris active move speed some physical reduction spell dodge and projectile avoidance all things that are great for us I have this fully upgraded. If I am running Lab, Minotaur, Chimera or roll crit chance and multiplier on a red tier map I will change to Soul of Solaris upgraded with at least the take no extra critical strike damage if you have taken a critical strike recently. 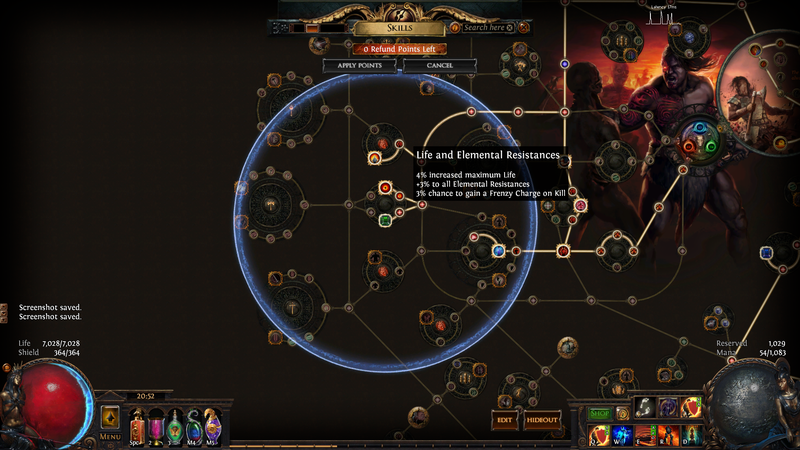 For shaper I will run Soul of Arakaali for the reduced damage over time when standing in his vortex's. Bring king upgraded with you cannot be frozen if recently frozen isn't bad but it is still very risky to open strong boxes without a freeze removal flask and going against tul breaches can also be deadly if you are over whelmed while frozen you will die quickly. So just trade our overflowing chalice for a move speed flask of heat when not doing guardian+ type bosses that require the damage boost. Minor: Outside of lab we must always run Soul of Yugul for the 25% reduced reflected damage taken or you will have a high chance of killing yourself on reflect mobs occasional as you move towards higher leveled gems and better gear. In lab feel free to run the Soul of Ryslatha for the flask regen to help with traps, just be very careful not to hit elemental reflect trash mobs as they can kill you. Shout out to @RicoKGB for some insight in to attack speed requirements for maximum discharge proc rate with the flow untethered. I heard furkann likes to carry noobs through the first areas of the game maybe if you ask him nicely he can get you to town safely. Path of building links updated. Added devotos with full gear to show end build damage and life. Also added scolds bridle version for even more dps able to achieve 2.5m peak dps. I cleaned the entire endgame with it, 10x Shaper / Chayula breachstone .. Yes lots of people complain about discharge if they have a bad pc haha! Updated some info added information regarding using The Taming and the pros and cons of that ring.